Collaboration is defined as two or more people working together to realize shared goals – it’s also the core principal of Bent Collective. Bent Collective is an engine for collaboration with a shared goal of fusing the talents of emerging DJs and producers to put their collective stamp on the over-ground of dance music. 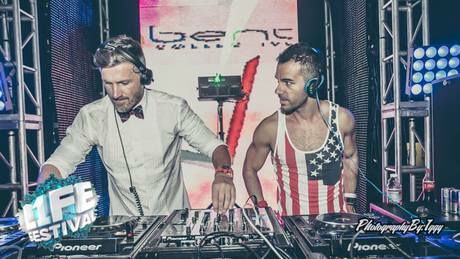 Bent Collective is comprised of two of Europe’s biggest talents, Danny Verde (Italy) and Steven Redant (Madrid). In between the solo and duo globetrotting DJ gigs, Bent Collective have been stealing away time in the studio working on original productions set for release throughout 2016 & 2017. Their first release, for American label Swishcraft Music, called “Get Up, Stand Up,” set for release in August 2016, is inspired by the Frantique disco classic of the same name. For More information about Danny & Steven, please click on their names above to be taken to their individual artist pages. To book Bent Collective, please contract Carmen Cacciatore at the Mighty Real Agency in New York at carmen@mightyrealagency.com. To book individually, please contact: management@dannyverde.com for Danny Verde or George Dellinger at madtizzy@mac.com for Steven Redant.